Going for eats with Miss Y is always an entertaining proposition. She loves to yak and her stories are both amusing and interesting. And in some cases, the jokes on me because she is usually fashionably late. Let's not forget the time she was an hour tardy for our afternoon tea at the Hotel Vancouver. The staff there thought I was stood up or something. But not to fear this time as I picked her up and hence, dinner would be on time. 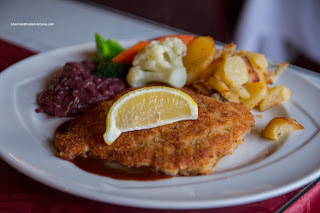 We decided to go to one of her favourite joints in New West being the Old Bavaria Haus (and on a Schnitzel Wednesday too!). I decided to try their Goulash first and it was really thick. Tasting somewhat like a mild chili with plenty of paprika, this was a meal in itself. There was lots of meaty morsels nestled within the rich tomatoey concoction. For my main, I had the Schnitzel Cordon Bleu. Naturally, it was stuffed with Swiss cheese and ham. The pounded pork was not exactly moist per se, but it wasn't extremely dry either (not supposed to be juicy anyways). 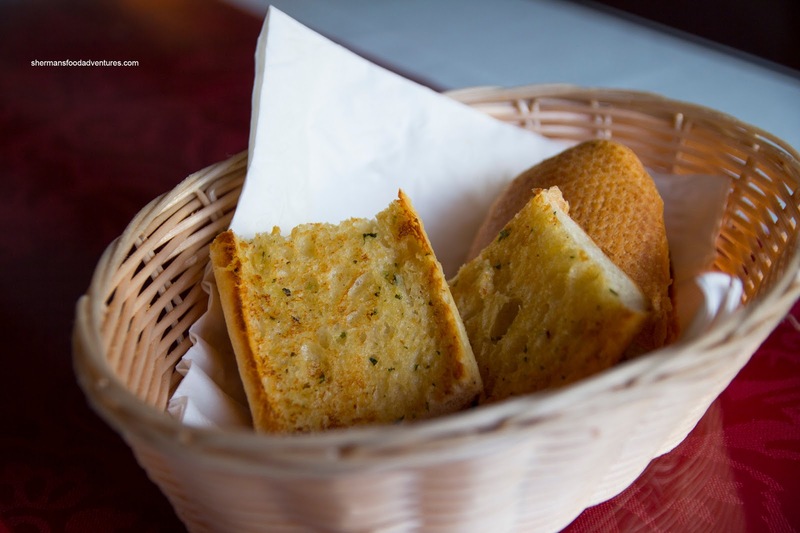 The exterior was nicely browned and lightly crunchy. I thought the meat was properly seasoned where there was flavour, but so much that we couldn't taste the meat. It was served with a mushroom gravy and on the side was veggies, red cabbage (a little mushy) and pan-fried potatoes (soft). Miss Y had my first choice being the Schnitzel Champignon. I couldn't order it as it would be boring talking about only one dish! It was a plain pork schnitzel topped with sauteed mushrooms and Bearnaise sauce. 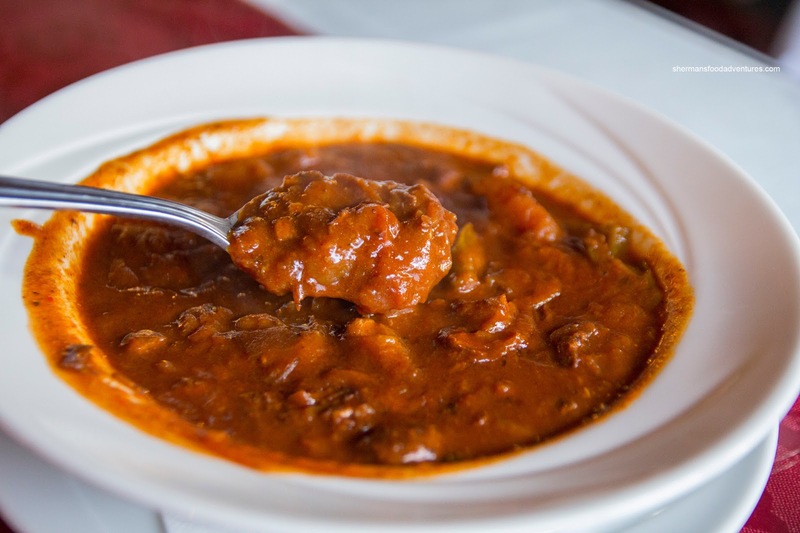 The sauce was thick, buttery and rich which helped provide moisture to the crunchy pork. A light meal this was not. 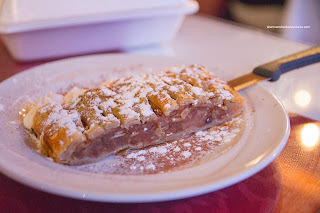 Lastly, we shared an order of their Apple Strudel. It was a little dense and being not really all that hot didn't help things. Hence, the flavours weren't really strong. It wasn't horrible by any stretch of the imagination, it just wasn't memorable either. Dessert withstanding, the schnitzel was decent and reasonably-priced, especially for a Wednesday. OBH sure has a long life as far as restos go in Metro Vanc. They were on Robson since at least the '80s, and my first time there was during summer of Expo 86 where I ate rabbit for the first time (that I knew of, anyway). Since they moved to NW in the early/mid-'90s (?) I've only been back once, and you're right they've remained "dated" (possibly catering to certain demographics). 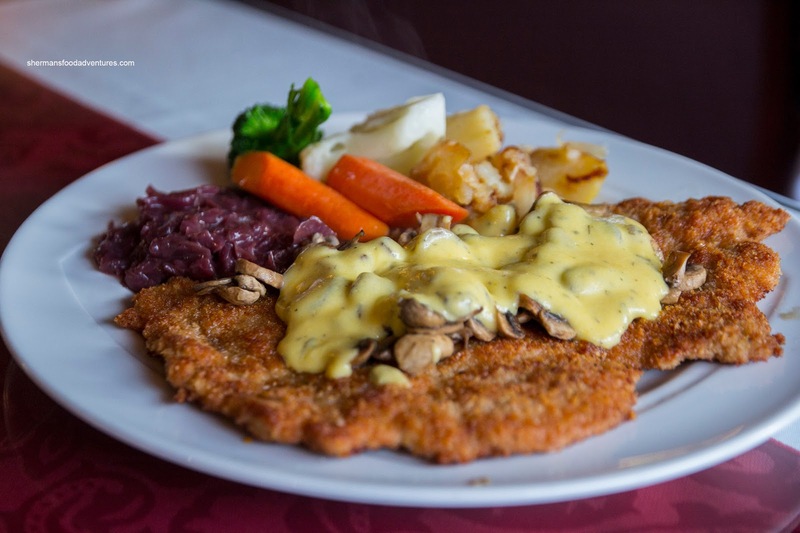 How would you rate, and compare, their schnitzels to those of the Alpen Club ? @LR I think the schnitzels at the Alpen club are good, but I like Jagerhof the best.